I think it’s safe to say this season isn’t living up to its early promise. I adore this show, but I have to be honest. I’m really not sure at all what they’re trying to do with Adele. I understand how Felix might have wanted to contact his biological family given all that’s going on with Sarah and I can understand him lashing out at her for her lack of compassion on the issue. But Orphan Black is a show that operates best when centered and not going off on wild little tangents. At least when it enters Hendrixland, the reason why is usually clear: comic relief. But Adele has just brought drama with her and drama is not something the show is short on. I was sure she would relate to the larger arc somehow, either by being a Neolutionist plant or by helping Felix and Sarah somehow. But Felix’s steadfast refusal to allow her into Clone Club is just puzzling. “No, Adele, I don’t want to get you mixed up in this drama.” “That’s okay Felix. I’m not you’re real family, this is your real family.” (Audience awwws). Really? We went through all that for some lame family sitcom payoff? I am disappointed, which I don’t often say as pertains to this show. The main portion of the story was Sarah getting sucked into the world of Trina, Tabitha, and Kendra, all three surrogates for Bright Born. Tabitha and Kendra made a terrible discovery while being held, sorry, housed at the Bright Born facility. Babies born with deformities are euthanized. Afraid for their unborn children, Kendra and Tabitha got evidence of their grisly discovery and escaped. 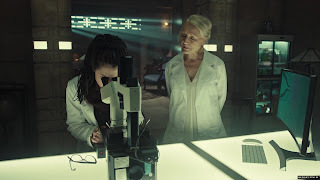 I’m not going to say this story was out of the blue, because we saw children being born with deformities and then hurried away when Cosima snuck into Bright Born. My problem more was that it seemed peripheral to the Sarah/Rachel power struggle. I was supposed to be so invested in Kendra and her baby but I just…wasn’t. Maybe if it had been Trina, who we’d seen several times before. But as it was I was just sort of underwhelmed. At least it lead to something truly interesting: Rachel’s alleged betrayal of Clone Club. That was just great. The way she used her reputation as an ice queen to totally convince Evie and the audience that she’d willingly toss her sisters and her mother under the bus. Was it too easy to get Evie caught on tape admitted she murders babies? Yes, yes it was, but damn it, it felt good to make progress this season. Rachel’s swan visions continue. The swan is now joined by a bunch of men with assault rifles. Again, weird freaking sentence. Helena returns! She’s been living in what I think is a yurt with something dead on her head but I don’t care, Helena is back and all is well with the world. Cosima is bonding with Susan as they science their way out of their predicament. She’s also learning about the history of Neolution. How much did I love Helena as the answer to Alison’s prayer?